Develop New Habits, Stop Laziness, and Procrastination Forever! Are you the kind of person who wants to stop laziness, beat procrastination, eliminate negative habits, or just simply to start a fitness, business, or any other program but can't seem to get started? Well, I have some good news for you! You can change all that negative and repetitive behavior that gives you the same results every month or year. Don't be that hamster who keeps running on the same wheel for a whole day, then a week, then a month and who doesn't get things done or simply has their life get worse every day by doing the negative things continuously. I have created this bundle of my top two self-help guides inside one audiobook that will definitely help you to change your life. 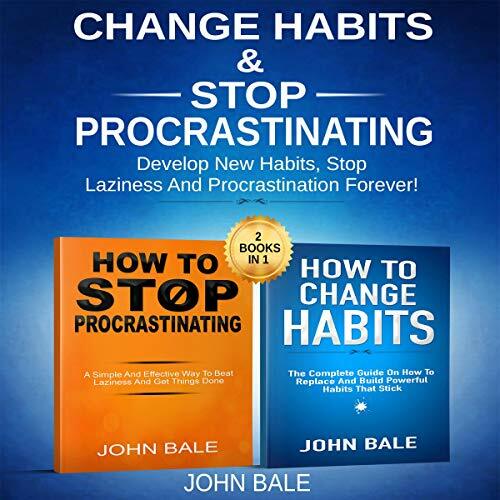 In these audiobooks, I have revealed to you step-by-step instructions on how to change that repetitive negative behavior and create the positive one that will change your life. What are the key symptoms of procrastination? What are the negative effects of procrastination?